I had a neat new bird migrate through the yard recently. She looked similar to a winter American Goldfinch at first glance. But then ta da! A flash of the tail like a lady opening a fan and you see the tail feathers form a pattern of two bright yellow spots. That made identification a little bit easier. 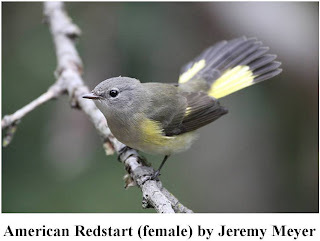 A quick flip through the Birds of Michigan field guide reveals that she is a female American Redstart. The fast movements and fanning of the tail is thought to flush bugs from the leaves so they can eat them, but it was quite a good show for me to watch too. Females and young males are gray-olive with yellow patches on each wing, on the sides of its breast, and at the base of its tail on either side. 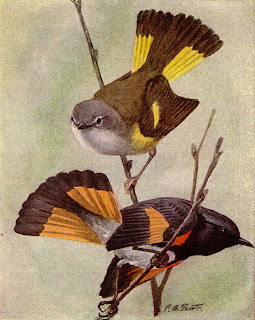 The males are black where the female is gray and orange where the female is yellow. They like shrubby woodland edges often near water. But you can see them pass through your yard in early October as they migrate to their winter home in Central America, the West Indies, and northern South America and then again in May when they migrate back to southern Canada and the eastern USA to nest. Saw one this morning outside the window. They jump frantically from branch to branch in search of bugs. And yes its a very beautiful bird. For the past two days, this tiny black beauty has been tapping at his reflection on my window in southern Vermont. He quickly flits from branch to branch of a bush, gorgeous yellow-orange and black tail quivering, then disappears into a nearby taller tree. A very busy hunter. Wish he would perch long enough for me to photograph.